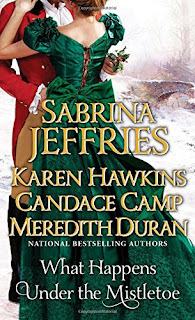 Stunned by the heat of an unexpected kiss on a cold winter's eve, two strangers from vastly different worlds turn hotheaded principles into burning passion in Sabrina Jeffries's delightful yuletide story, "The Heiress and the Hothead." In the snowy Scottish countryside, Karen Hawkins's rakish duke has an unforgettable holiday encounter in "Twelve Kisses" when the alluring lady he surprises under the mistletoe is not who he expected, but a long-lost love with a score to settle. In "By Any Other Name," Edinburgh is aglitter for Christmastime as Candace Camp sends a curious gentleman in hot pursuit of an intriguing lady in disguise--one who refuses to reveal her true identity, though she fears he has already stolen her heart with his kiss. In "Sweet Ruin," will the festive spirit of the season sweep Meredith Duran's feisty heroine beneath the mistletoe--and back into the arms of the dashing rogue whose carelessness soiled her reputation and sent her into exile in London? Stunned by the heat of an unexpected kiss on a cold winter’s eve, two strangers from vastly different worlds turn hotheaded principles into burning passion. Sabrina Jeffries is one of my favourite authors and this story doesn’t disappoint. It’s part of the Sinful Suitors series but stands nicely on its own. As usual, lively characters, strong emotion and an unusual premise give this tale something more than most. Stephen and Amanda were made to work hard to win their happily ever after but it was worth it. In the snowy Scottish countryside a rakish duke has an unforgettable holiday encounter when the alluring lady her surprises under the mistletoe is not who he expected, but a long-lost love with a score to settle. Hoots mon! Och, aye, if you’re looking for a cringeworthy attempt at a Scottish romance then dinnae look any further than this book. Ye hear me, aye? Life is far too short to force yourself to read such embarrassing tripe. Edinburgh is aglitter for Christmastime as a curious gentleman is in hot pursuit of an intriguing lady in disguise - one who refuses to reveal her true identity, but fears he has already stole her heart with his kisses. Aaargh - this story was as cute as a button! Both Gregory and Rylla were fun, well-rounded characters and their romance was so sweet. This felt different from other ‘girl dresses as boy’ stories and Edinburgh felt authentic. The story was let down slightly by a few too many Americanisms but still a good read all round. Will the festive spirit of the season sweep feisty Georgiana beneath the mistletoe and back into the arms of dashing rogue, Lucas, who broke her heart two years ago? I love a second chance at love story and I love a story where the hero and heroine are initially at odds. This had both. Packed with a great blend of fun, emotion and sweetness - Georgie and Lucas really stood out for me. Loved it. Three great stories make this Christmas anthology a keeper. A definite read for those cosy nights in the run up to Christmas. 4 stars. Snow is on the ground and Christmas lights twinkle in the German Christmas market. The warm, spiced wine is just right, but there's still one key ingredient missing from her romantic dream. Will Mia's Christmas turn out to be sugar and spice and all things nice - or a deflated soufflé of loneliness and regret without the man of her dreams? 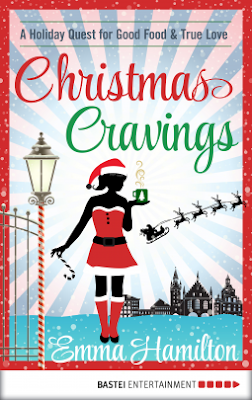 Christmas Cravings is a festive romance standalone episode from the Greedily Yours series. About the series: Mia Maxwell loves food. She loves it so much that she's made it her career. She owns a food PR business that fills her days, and by night she's a food blogger with a burgeoning audience. With her 'Culinary Confessions of a Greedy Girl', Mia takes the reader on a delicious journey, searching for top dishes and the perfect man. This Christmas novella is part of the Greedily Yours series - a serial novel that’s available in 8 parts all focussing on Mia, a food blogger on the search for good food and the perfect man. Despite being part of a series, this little Christmas tale is a standalone story so you don’t need to have read the novels to understand and enjoy this book. I really liked the writing style of the author. 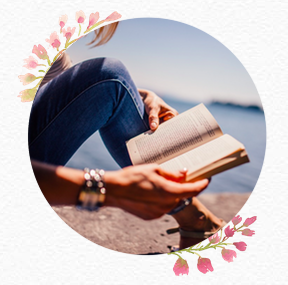 I’m not normally a fan of chick lit but this one really drew me in and made me keep coming back just wanting to read a little more each time. This is the first book I’ve read by this author and I’m definitely going to check out the Greedily Yours series and any other books by the author. Although the story wasn’t overly romantic - more sweet than anything - I was still really rooting for Tom and Mia. They were both very real characters and it was hard not to like both of them but Mia especially. I was quite surprised that the main conflict was resolved well before the end of the story. Not that it matters but it kind of made the book one of two distinct halves. In a series called ‘Greedily Yours’, obviously the food is a key feature of the book. And boy-oh-boy, if you’re not hungry when you start reading the book then you will be by the time you’re finished. Every sight, smell and taste sensation is described in delicious detail, in a way that makes it seem real - but unfortunately not real enough! There are also a few recipes included at the end of the story which is a definite bonus. This is a quick (98 pages), cute and Christmassy story that is perfect for a lazy afternoon when it’s raining (or snowing?) outside. I would definitely recommend this tasty little story for anyone who enjoys food, Christmas and romance.